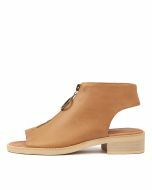 A contemporary choice for the fashion-forward dresser, this block-heeled sandal will complement an array of seasonal looks. Crafted from soft leather, the shoe features an open toe and back as well as a front zipper for that street-style feel! Lend a casually cool finish to denim and dresses by pairing them with this standout design.